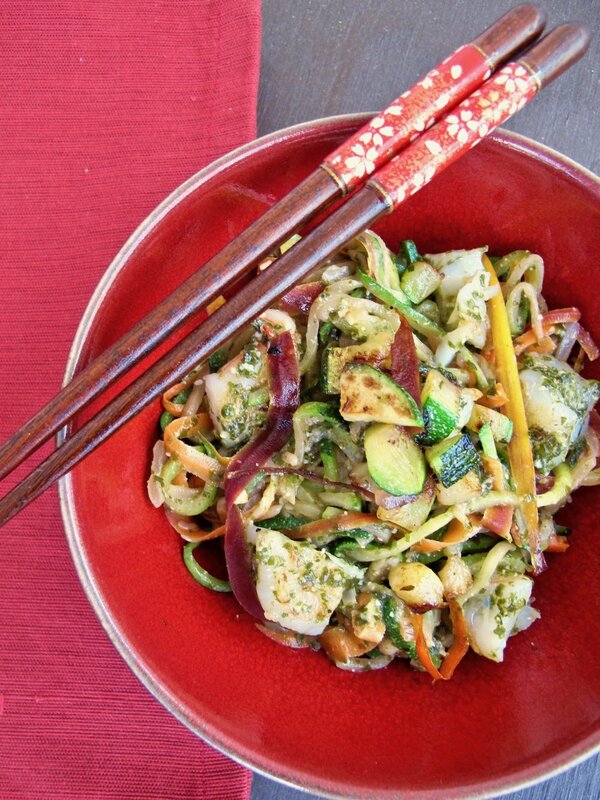 Zucchini noodles with seaweed pesto is a healthy gluten free pasta with spiralized zoodles. Nutrient-dense seaweed pesto tops the healthy main or side dish. Christmas came early to my house last week when I became the proud recipient of a Spiralizer. It was a gift to me, from me. I call it a gift to my health since it makes gluten free eating much easier. The spiralizer makes noodles out of almost any vegetable you can imagine. This allows you to swap processed pasta for something much healthier. No, I'm not getting paid by them. I did pay for my Spiralizer all by myself, so I won't infomercial you, but google it, and you'll be mesmerized by the applications - sweet potato fries, cole slaw, beet rings, and most importantly, pasta. Well fake pasta. Vegetable pasta. It does give you the look of a long pasta noodle, but it's all vegetable, or in my case, zucchini, or zoodles. I doubled down with some carrot for added benefit, not to mention color. You can also add chicken or another protein to make this a nice one-dish meal. I've been having fun creating different spiralizer noodle recipes like chicken and zoodles with spicy avocado sauce. I've even tried butternut squash as the noodle base and mixed it with mushrooms and kale. So many options! I put my seaweed pesto on my first batch of zoodles to make this an uber healthy dish. It has a whole gaggle of good for you antioxidants, magnesium, iron, folate, iodine, vitamins as well as calcium. If you want to learn more about the amazing benefits of seaweed, you can read all about it in my seaweed primer here. So come for the health benefits of this recipe, but stay for the taste of these flavorful zucchini noodles with seaweed pesto. Spiralize zucchini or cut into thin strands. Use a grater to create strips of carrot. Place oil in a large skillet and when hot, sauté onions until translucent. Add zucchini and carrots. Use tongs to gently toss. Cook 3-4 minutes until it just begins to soften. Don't overcook them or they'll turn to mush. Place noodle mixture in a bowl. Water may have released and if so, drain it and then add the pesto and shrimp. Toss and serve. Want more vegetable noodle options? Try one of these.